The old school method of physically walking into a bank to process a transaction is on its way out the door. Nowadays, transactions can conveniently be made from the comfort of your own home: with a PC or mobile device handy, transferring money has never been easier. Yet what many fail to realize when logging into Wi-Fi, be it privately in your own home or via a public network, is that online banking security is never truly 100% secure, and cybercriminals could be tapping into your banking session… a daunting thought, to say the least. There’s also another question to be asked: are banking apps safe to use? But fear not, as by simply adding a VPN to the mix adds a huge preventative wall for potential cyber-hackers, making it near impossible for them to get past it, and into your banking. The Wi-Fi vulnerability known as ‘Krack’ (Key Reinstallation AttaCK) has affected millions, with a record-breaking number of victims have been reported in 2017 alone. On top of that, the figures associated with online banking fraud have more than doubled since 2010, leading to the question; is online banking safe? The 2015 ‘Carbanak cybergang’ operation reported by Kaspersky lead to a massive $1 billion stolen from 100 banks across 20 countries, with what may be the biggest cyberbanking breach ever. This new era of cyber-crime has, unsurprisingly, led to the general public questioning online banking security. A cyber attacker within range of a victim can read information that believed to be ‘secure’, gaining access to sensitive data such as credit card numbers, emails, and passwords – even when supposedly practicing ‘safe internet banking’. How Does a VPN Make Banking Safer? The key way to protect yourself from these felons is by using a secure VPN. These Virtual Private Networks create an encrypted tunnel for your personal information and online activity. Safe online banking can only be achieved when using a VPN as it works by shielding against the leaking of your private information, especially when connecting to a public Wi-Fi hotspot. A VPN provides users with an artificial IP located in another country, thus masking the true IP location. This, in turn, safeguards users from hackers, shielding users from tracking by their Internet Service Provider and even from government surveillance. If you had ever wondered ‘are banking apps safe’, then hopefully this will answer your questions. Read on for a breakdown of the best VPNs out there so that you can securely bank online without having to break a sweat. ExpressVPN is the number one trusted leader in VPNs and is considered the crème de la crème. With over 145 VPN locations to choose from, users can connect from almost anywhere in the world and get their hands on unlimited bandwidth. Their network boasts extraordinarily fast download speeds and is SSL secured through the use of 256-bit AES encryption, effectively meaning your banking data and sensitive information will be immensely secure. Their 30-day money-back guarantee means that if you aren’t happy with the service, you can simply get your money back or make an inquiry to their 24/7 customer support team. If you’re asking ‘is online banking safe?’ then you can rest assured that when masking your IP with ExpressVPN, it certainly will be. What gives NordVPN the tightest security in the industry is that they encrypt their data not once, but twice for added security. 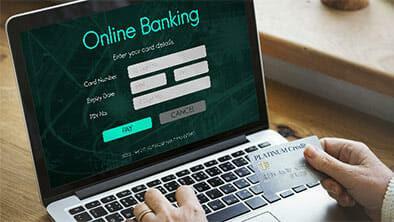 What makes your connection even more impenetrable especially when it comes to online banking, is that no logs are kept, which highly increases anonymity. As well as this, NordVPN uniquely offers an Internet Kill Switch for if your VPN connection drops out, so there’s no need to worry about accidental exposure of your online banking data. With three days free trial to go along with their 30 day money back guarantee (which also includes BitCoin subscribers), there’s not much to lose. The downside is, that when it comes to NordVPN, speed can vary particularly during peak hours and there can be the occasional glitch. PrivateVPN is another highly fast and reliable VPN service. Their premium standard privacy plan fully encrypts all data and protects against hackers when sharing sensitive financial data online. The VPN ensures that no logs are recorded and that there is no third-party sharing under any circumstance. One outstanding benefit is that users can connect up to six devices at once (and this is one of the only VPNs which has this benefit) however, the PrivateVPN app when using Mac had fewer features than the Windows version. Offering a 30-day money back guarantee trial, this is certainly a high standard VPN option. IPVanish claims a fiercely strong 256-bit AES encryption (the same as that used by ExpressVPN) and covers all traffic logs. With a super speedy connection, you’ll be able to complete your online transactions in no time. If you are asking ‘are online banks safe?’ and what about ‘is mobile banking safe?’ the answer as you may have guessed is only when using a VPN. It is foolish to rely on the security of the online banking system and particularly public Wi-Fi hotspots. IPVanish also has a highly user-friendly app making it simple to complete your online banking safely when on the go. IPVanish offers a 7-day money-back guarantee, though this is less than the other VPNs mentioned here, it shouldn’t take longer than a week to try and see if it’s the VPN for you. On top of using a VPN for safe online banking etiquette, there are a number of other things you can do to make sure that you don’t regret completing your transactions online. Try to stay away from public Wi-Fi hotspots (especially if not using a VPN). Come up with a fiercely robust password – use upper and lower case characters as well as numbers. Make sure your antivirus software is always updated. Check your bank balance and accounting details regularly. Use a password manager to save your password. Any sane person will realize that in a world where cyber hackers are becoming more and more prominent, it is essential to practice safe online use, especially when it comes to completing online transactions and keeping your money out of the wrong hands. By following our tips for safe internet banking with the most important element being in a secure VPN, you can sleep easy knowing your money and privacy are both safe. A credible VPN service should provide access to a wide range of locations, be very fast and most importantly; secure. With an impenetrable encryption and many security protocols in place, ExpressVPN ticks all the boxes coming in at number one of our top recommended VPN.